Join us on July 31 at 10:30 a.m. for the public unveiling of the original 1967 "Star Trek" set piece Galileo. 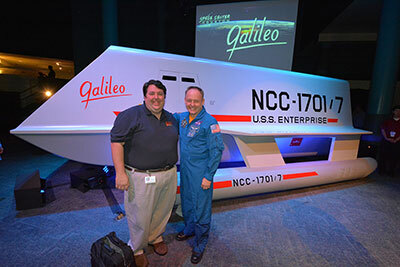 The newly restored spaceship prop first featured in the episode "The Galileo Seven" will go on permanent display at Space Center Houston after a yearlong restoration project lead by Adam Schnieder, a die-hard Star Trek fan and memorabilia collector. The life-size spaceship will be on permanent display inside the Zero-G Diner and will be one of a very few exhibitions in the world where visitors can see iconic sci-fi history that has influenced generations of innovators. Thanks to our event partner Space City Con and NASA, we are excited to offer a full day of activities as we look at the influence science fiction has on science fact! Don Marshall, Lt. Boma from the original 1967 "Galileo Seven" episode of "Star Trek"
Robert Picardo, The Doctor in "Star Trek: Voyager"
Denise Crosby, Security Chief Tasha Yar from "Star Trek: The Next Generation"
Tracy Scoggins, Capt. Elizabeth Lockley from "Babylon 5"
Gil Gerard, Captain William Buck Rogers in "Buck Rogers in 25th Century"
Marshall Teague, Played supporting roles in "Star Trek: Deep Space Nine" and "Star Trek: Voyager"
Geeky cool! Real-life and fictional space explorers in one place. Wonder if they'll display a model of the Jupiter probe Galileo and a photo of the namesake Italian scientist alongside? Don Marshall also appeared in the 1960's Irwin Allen TV series "Land of the Giants" as pilot Dan Erickson. He was one of a handful of African-American actors to appear in high-profile roles that broke racial stereotypes, including Nichelle Nichols as Uhura in "Star Trek" and Greg Morris as Barney in "Mission: Impossible." He also appeared in "Julia" opposite Diahann Carroll. Quite a resume. I've seen an artist's concept of what Space Center Houston eventually has planned for the shuttlecraft exhibit, and it's very cool. I'm not sure though, if it includes mention or any representation of the other Gailieos. Marshall Teague, by the way, also played astronaut "Colonel Davis" in the movie "Armageddon." The first shuttlecraft from the original 1967 "Star Trek" television series has landed at a real-life space center for its final away mission. Space Center Houston, the official visitor center for NASA's Johnson Space Center in Texas, unveiled the newly-fan-restored Shuttlecraft Galileo on Wednesday (July 31) during a science fiction celebrity-studded event that featured one of the original actors from the full-scale spacecraft's debut episode. Actor Don Marshall, who portrayed Starfleet Lieutenant Boma "The Galileo Seven," helped launch the prop's public display. "This is Galileo!" announced Marshall as the drape covering the shuttlecraft was pulled away. 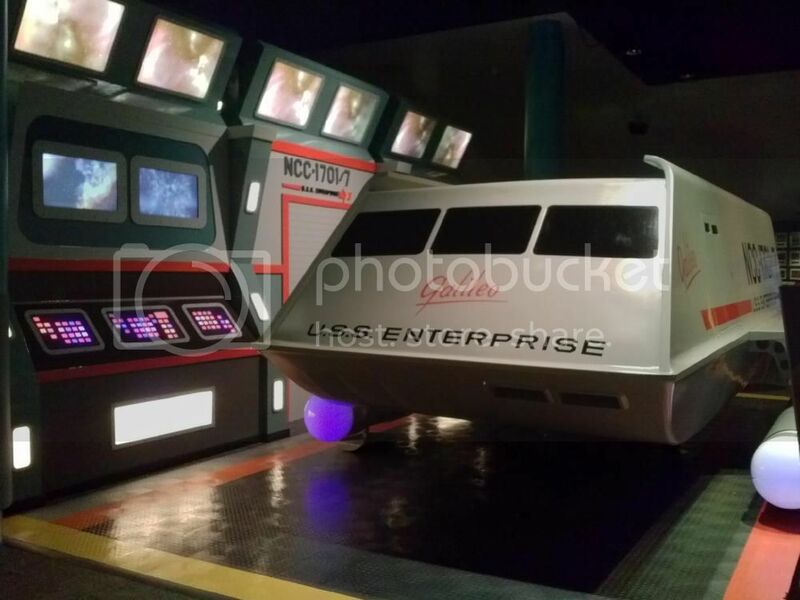 For all you Star Trek fans, I thought this was worth sharing... Looks like SCH has finished it's 'Hangar Bay' mockup in which to display the Galileo. It's really nice! The Intrepid Sea, Air & Space Museum today (May 6) announced the upcoming display of its temporary exhibit, the fully restored prop Shuttlecraft Galileo, the shuttlecraft that carried the crew of starship USS Enterprise to other planets in Star Trek: The Original Series (1967-1969). The exhibit is located in the museum's Space Shuttle Pavilion alongside the space shuttle Enterprise, and will open to the public on Friday, May 13 at the museum's free AstroCafe event. This life-size prop debuted in the episode "The Galileo Seven" in 1967. Galileo, commanded by Mr. Spock, crash-lands on a hostile planet. The fictional Galileo did not survive the episode, but the model lived on, appearing in six other episodes. Galileo will be on display at the Intrepid Museum through December 5, 2016. It is on loan from Space Center Houston, and is a gift of Adam and Leslie Schneider. Looks like Intrepid is having a larger Star Trek event with the Starfleet Academy Experience... pretty cool stuff! If you scroll down there is a photo of Galileo underneath Enterprise.